Can this possibly be turned into climbing equipment? But after assembling work lasting less than one and a half to two hours, you will find out that after all it was not that difficult. To make it even easier, we are enclosing some hints and bits of advice, which however should not be regarded as a substitute to the assembling instructions. Prior to commencing with the unpacking, you should measure the height of your room exactly in that part of the room, where the equipment is to be assembled. 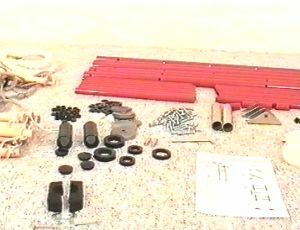 Compare these measurements with the assembling height of the supplied JimmyGym equipment, as mentioned in the assembling instructions. Should you find that the JimmyGym does not fit in the room, do make a point of contacting your dealer immediately. Check the total number of spare parts with the stocklist in the assembling instructions. You should commence the assembling only, if and when all parts are available. Check the ceiling of your room. The JimmyGym cannot be fitted on slanting ceillings or ceilings made of separate panels, which are suspended on wires. In case of firm ceilings made of concrete, you can immediately commence with the assembling work. You can calculate the length (x), to which the height adjustment should protrude from the top-part of the ladder in accordance with the formula shown in the Assembly Information. 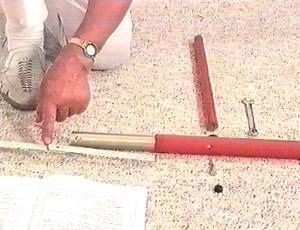 Adjust the protruding inner movable part of the top-bar of the ladder in such a way as to let it reach the calculated measurement. Should the holes of the protruding inside not quite coincide with the hole of the outer bar, push the inside in a little more, until the holes coincide, after which you secure the position with a screw. 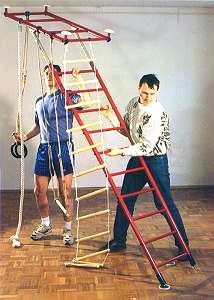 Next, you connect the lower with the upper ladder parts, you fit the rungs in and you assemble the ladder, preferably positioned flat on the floor. The black washers are placed between rung and ladder frame. Start with the fastening of the triangular mountings on to the ceiling frame. Finally you fasten the four supports. 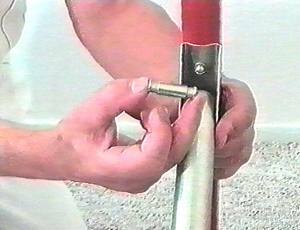 Do not forget to place the washer discs between frame poles and supports. Please note that the support should not point in the same direction as the holders. 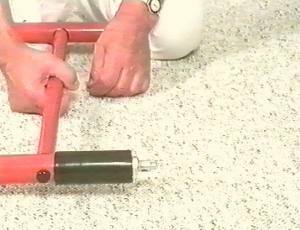 Connect the metal ladder and the frame with the pin in such a way that the pin is firmly placed. Prior to putting the equipment upright, do not forget to place the black shells onto the lower ends of the ladder and to fasten them with adhesive tape. 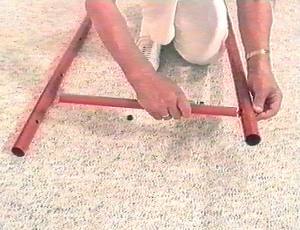 Place the Gym Set flat on the floor, so that the supports point to the top. Fasten the white rubber plugs firmly on to the washers. 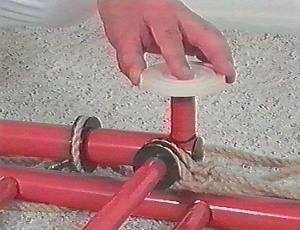 Then press the washers with the rubber plugs onto the supports. In order to put the equipment into an upright position, you definitely require somebody to assist you and you may also require a pair of steps. 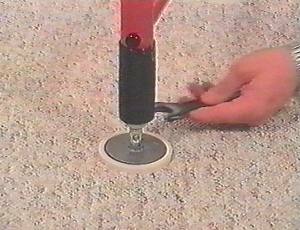 Place the two washer discs in the correct positions on the floor. Then lift the equipment upright. 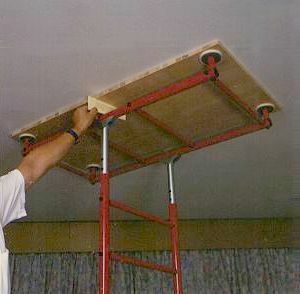 Your assistant should hold the ceiling frame in a horizontal position. With the equipment positioned reasonably straight in the appointed area of the room, the tension screws at the bottom of the equipment should be evenly tightened, until a moderate degree of pressure against the ceiling has been obtained. At that point you can still adjust and move the equipment. 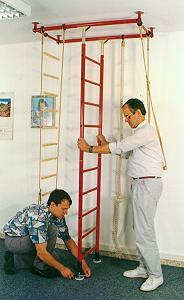 You should pay attention to ensure that the ladder is in a completely vertical position - and not twisted in any way. 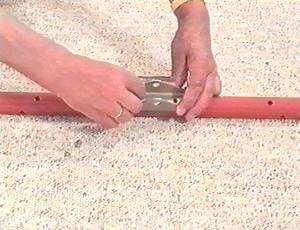 If necessary, check the straight position of the ladder with the aid of a plumbline. 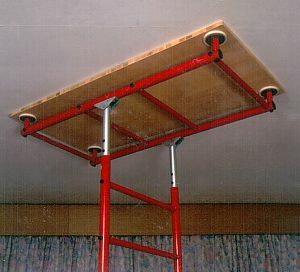 Make sure that the pins, which connect the metal ladder with the ceiling frame, are firmly embedded in the holders. Next the JimmyGym is being firmly stabilized. The ceiling frame should then show a slight curve. The correct stabilization with particular reference to the curve is checked with the aid of a template. Then tighten the nuts on the screws at the bottom of the ladder. During the first week you should check the tension every day, during the first month once a week and then at the end of each month. You must correct the tension, if necessary. If after one month adjustments still prove to be necessary, there must be doubts as to the adequate firmness of the room.